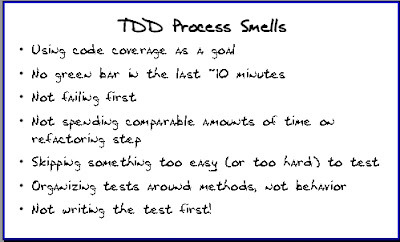 I think it's important for you to emphasize that TDD is primarily about design, and the 'smells' we should be looking out for are the ones which indicate the design process is being ignored or undermined. Sure, we utilize familiar unit testing techniques and tools, but the goal really has little or nothing to do with unit testing or associated code coverage levels. If you're not breaking your TDD tests regularly, then it's likely you've not applying the Red-Green-Refactor motto. I cannot stress strongly enough how significant quality infusion is to sustainability. Without it, the application will become rigid and fragile over time, and velocity will inevitably slow as complexity increases. Rightfully so, but we only have one little 3x5 space on the card. Your comments belong in the commentary though. Not going red is a great hindrance.